In Miami, everyone wants a piece of the waterfront. Condos, restaurants and private homes all try to stake claim on the ever-disappearing property by bay (and sea). 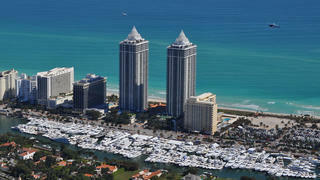 Luckily, in a water-centric city like Miami, marinas take up a good portion of this prime real estate. With dockage available in every waterfront neighbourhood, you can decide what amenities you seek, how much privacy you desire and which part of Miami you’d like to be based to explore this exciting city. 1. One Island Park The One Island Park compound opened in Miami Beach in November last year and is designed solely for superyachts and is able to accommodate yachts measuring up to 244 metres in its deep water berths. Visitors to One Island Park will enjoy a vast range of VIP concierge services, as well as a high level of exclusivity. The new compound was designed to showcase both the area and the best standards of service, meaning it will become an extremely popular spot for private owners, while its location means that clients can enjoy the thriving art scene, the beaches and the nightlife of Miami. 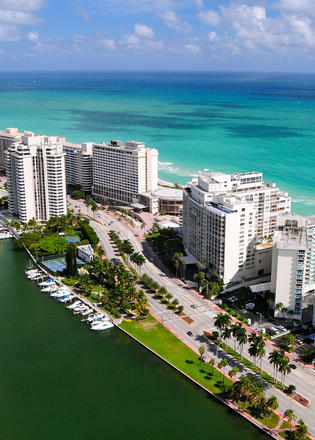 In Miami, everyone wants a piece of the waterfront. Condos, restaurants and private homes all try to stake claim on the ever-disappearing property by bay (and sea). 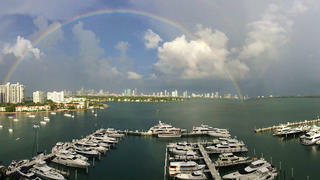 Luckily, in a water-centric city like Miami, marinas take up a good portion of this prime real estate. With dockage available in every waterfront neighbourhood, you can decide what amenities you seek, how much privacy you desire and which part of Miami you’d like to be based to explore this exciting city. 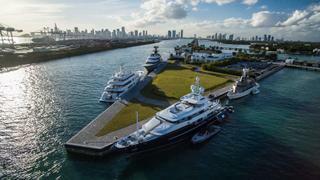 The One Island Park compound opened in Miami Beach in November last year and is designed solely for superyachts and is able to accommodate yachts measuring up to 244 metres in its deep water berths. 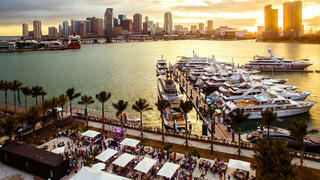 Visitors to One Island Park will enjoy a vast range of VIP concierge services, as well as a high level of exclusivity. The new compound was designed to showcase both the area and the best standards of service, meaning it will become an extremely popular spot for private owners, while its location means that clients can enjoy the thriving art scene, the beaches and the nightlife of Miami. The new superyacht marina Island Gardens Deep Harbour is situated on Watson Island and is capable of berthing 50 superyachts measuring up to 167 metres. The retail and residential aspects of the marina are not expected to be completed for the next two years, but the marina is fully operational with 1,524 linear metres of capacity with drafts of 5.4-6.4 metres deep. Home to the U.S. 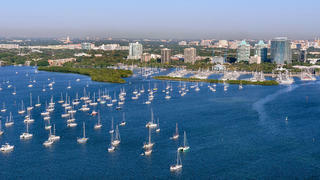 Sailing Center and multiple yacht clubs, Coconut Grove is a hotbed for yachting activity. The 582-slip Dinner Key Marina, which survived the worst of the hurricane damage in September, sits right in the centre, and only steps away from the shops and restaurants of “The Grove.” The protected marina hosts yachts up to 38 metres with two metres of draft. The Sea Isle Marina and Yachting Centre is a great place for yachts up to 42 metres to tie-up and be in close distance to what downtown has to offer with the Adrienne Arsht Center for the performing arts and the arena where the Miami Heat play right around the corner. There are also great restaurants right on site, as well as fuel and a ship’s store. Surrounded by shops, dining and even an outdoor auditorium, the Miamarina at Bayside is a lively marina. The marina has 130 slips and hosts yachts up to 60 metres and offers easy access to both the Atlantic through Government Cut and to Biscayne Bay and the Florida Keys to the south. Epic Marina is surely one of the plushest in Miami and despite being hit hard during Hurricane Irma, is once again capable of hosting superyachts up to 95 metres. 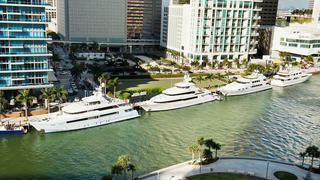 In the shadow of Miami’s luxe Epic Residences & Hotel, the marina isn’t short on high-end amenities. Guests can enjoy sumptuous meals at on site restaurants Area 31 and Zuma. Set off the Venetian Causeway on Biscayne Bay, Sunset Harbour Yacht Club offers ample dockage outside of the hubbub of the Miami Beach scene. Catering to yachts up to 45 metres with 125 deepwater slips, the designated “clean marina”, an initiative started by the Florida Department of Environmental Protection, has some great amenities including a pool and fitness centre. Fuel can be delivered and it is loacated right around the corner from a large Publix supermarket for easy provisioning. Across from Miami’s iconic and historic Fountainbleau Resort on Collins Avenue, Indian Creek Marina at the Fountainbleau Resort (home to one of the best hotel spas to visit in Miami) can host yachts up to 76 metres. 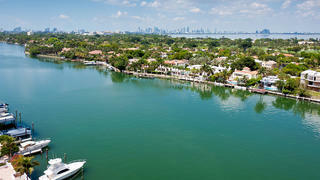 In February, this waterway is lined with yachts during the Miami Yacht and Brokerage Show. The rest of the year, it’s open to transiting yachts and makes a great destination marina that is in close distance to Miami’s finest spas and eateries, as it's located right across from the beach. 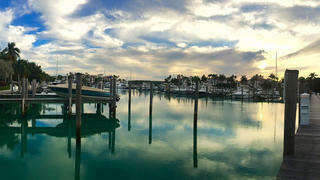 In the south end of Miami Beach, the full-service Miami Beach Marina has 400 slips for yachts up to 76 metres. 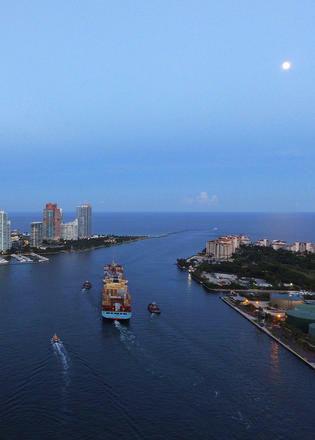 The marina offers direct access to Government Cut, a manmade shipping channel between Miami Beach and Fisher Island, which allows better access to the Port of Miami. Likewise, it’s only moments to the best of what South Beach has to offer; the beach and the best restaurants, nightlife and spas are just steps away. Yachtsmen seeking a private marina experience while in Miami should look no further than these havens: The exclusive private island community of Fisher Island Club, across from Miami Beach, is ‘members only’, but sponsorship (from a member or the dockmaster) allows temporary membership for yachts up to 76.2 metres in length to tie up in the marina. And their owners can enjoy all the perks of the club, including the beach club, spa, tennis centre, hotel, restaurants and PB Dye-designed golf course. Midway between Miami and Fort Lauderdale in Aventura, Turnberry Isle Marina Yacht Club accommodates 117 yachts up to 45-metres. Amenities include 24-hour security, a private ocean club, pool, spa, several restaurants, and two 18-hole Raymond Floyd-designed championship golf courses. The exclusive private island community of Fisher Island Club, across from Miami Beach, is ‘members only’, but sponsorship (from a member or the dockmaster) allows temporary membership for yachts up to 76.2 metres in length to tie up in the marina. And their owners can enjoy all the perks of the club, including the beach club, spa, tennis centre, hotel, restaurants and PB Dye-designed golf course. Midway between Miami and Fort Lauderdale in Aventura, Turnberry Isle Marina Yacht Club accommodates 117 yachts up to 45-metres. Amenities include 24-hour security, a private ocean club, pool, spa, several restaurants, and two 18-hole Raymond Floyd-designed championship golf courses.